Artists often challenge the status quo and open us to new perspectives and experiences. In what ways can public art create an experience bringing viewers in to become integrated into the art? 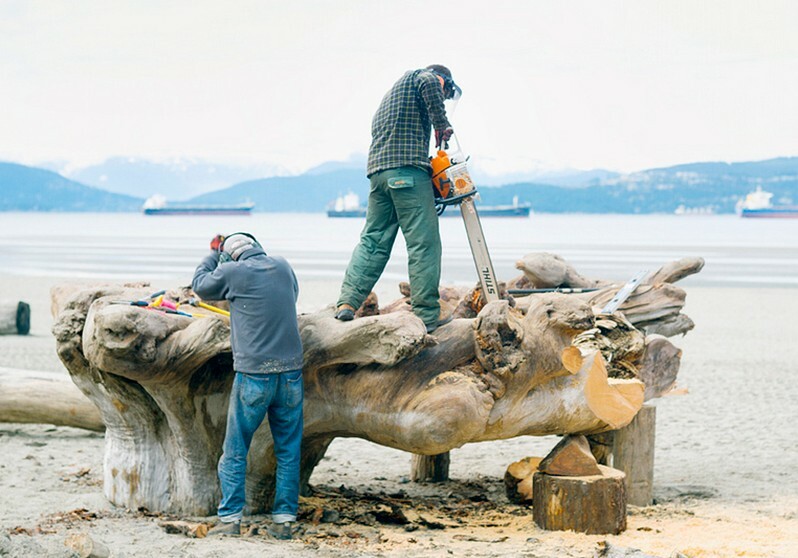 How can wood carvings connect the viewers so they become one with nature and the tree? • For younger students, read the book Seven Blind Mice by Chrisonne Hollis to introduce the concept taking different viewpoints. • Create a pocket journal book by folding accordion-style a long strip of paper, tied together to close. This gives students a portable book to fill with writing responses, rubbing or drawing activities that may be part of the art inquiry experience. BIG IDEAS Anywhere educators: View the Public Furniture | Urban Trees Guided Tour Video MUTE ON and encourage students to explore at different angles individually and in groups. Age and History: Count the rings of part of the tree to get a sense of how old is the tree. Discuss the history that happened during this tree’s lifetime and ask the students to imagine what might have happened to the tree. • View Guided Tour Video: View the Public Furniture | Urban Trees Guided Tour Video again with SOUND ON. • Significant Aspects of Hugo Franca’s Life: What are some significant aspects of Hugo França’s life? Using the About Artist and Artwork (PDF)) the teacher creates stations detailing França’s life and work. In small groups students rotate through stations detailing the artist’s life and work. Station topics might include: (1) education and training; (2) lifetime of artwork; (2) materials and processes; (3) beliefs and values. At each station, students answer questions and complete a task. For example, at the station “life’s work” students might plot the artist’s various installations on a map of the world. The locations to date include Porto Alegre, Sao Paulo, Trancoso, Bahia & Rio de Janeiro, Brazil; Saint-Etienne, France; New York City, USA; Squamish & Vancouver, Canada. Encourage students to draw a parallels to their own life and reflect on the countries/cities/communities that they have lived and the significance of each location to them. What do you think sculpture/installation art can look like? How big or small can a sculpture/installation art be? What kinds of shapes and textures? What can sculpture/ installation art be made of? How can it be made? What sculpture/installation art can you think of? Where can you find sculpture/installation art? Who can create a sculpture/installation art? What can it be about? What makes sculpture/installation art different than other forms of art? • Visual Literacy Challenge: Facilitates a discussion on terms from the elements of art and terms like scale, balance, shape, line, and texture referencing artist’s works. • Design Challenge: Ask students to draw or sculpt in clay a piece of furniture or sculptural design from the shape of a tree or part of a tree. Show students other furniture artists or architectural designs that use organic forms and wood and discuss different styles and approaches. The design concept is to follow the Guiding Question: how can wood carvings connect the viewers so they become one with nature and the tree? • Ideas for Cross-curricular Access: Ask the students to connect the artist and artwork to other subject areas: Social Studies, Science, and Mathematics. Possible learning concepts and content may include environment, resources, Indigenous artwork, politics, 3D objects, area and measurements, shapes and forms. Make reference to Cross-Curricular Access section if applicable. 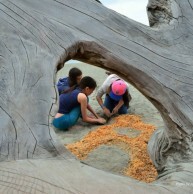 Encourage students to look into the connection between the logging and lumber industry of Vancouver and Squamish and the artist’s work. 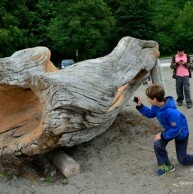 Squamish in particular has many memories and ties to lumber industry. • Waste Management: Find out about the waste mismanagement in lumber industry and impact of drift wood monopoly and beaches being choked with drift wood. • Sustainable Design: Discuss new thoughts about trees and specifically discarded trees and other materials. How do we use and experience them? Students can create artworks from recycled materials. Teacher and students can reflect on their entire learning process by revisiting the Enduring Understanding and relevant Guiding Questions. How did the unit of study open inquiry, create cross–curricular learning opportunities and/or apply learning to real life situations? Has this unit of inquiry changed your opinions, values and world view? In what ways, if any, has it helped you grow as a learner? • Mathematics – Proportional Reasoning and Relating Quantities in Real-Life Context: Estimate the age of a Franca public furniture piece and determine the age of a live tree. Compare the techniques used to estimate the age in both cases and describe what can be learned from this process. • Science – Cell theory: Learn about the anatomy of a tree and specifically the cambium cell layer as the growing part of the trunk. 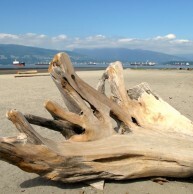 Look into a variety of wood unique to Vancouver that Franca uses and identity any differences in the anatomy. • Social Studies – Discoveries and innovations/Progress or Decline: Students to research the pros and cons of logging to find answers and viewpoints on this issue. Ask students to pick a ‘side’ and discuss/debate based on their findings.